Stranded in Chicago: Reality bites. I almost didn't post this because I am somewhat ashamed of certain parts of this outfit, but I promised you more outfit posts, and it's time you learned about one of the sad realities of my life. Yes, my friends, those are Uggs. I ruined a nearly flawless outfit by wearing Uggs. I desperately wanted to wear my Steve Madden oxfords, but it was cold and rainy and I didn't want them to get ruined! So now you know that, in spite of the big game I talk, I often give in to the evil temper of the weather and just wear something that keeps as much of my body warm as possible. 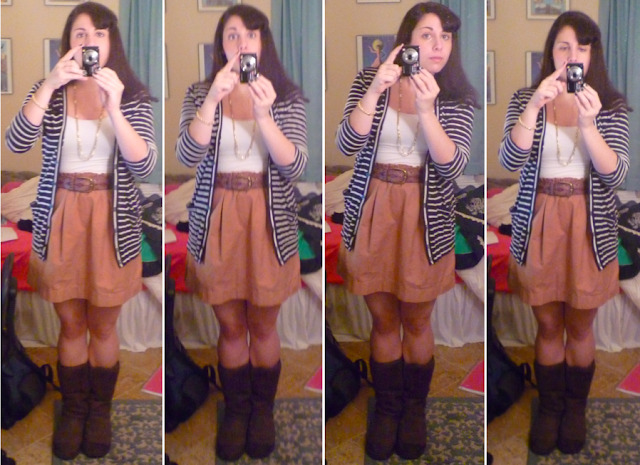 As for the rest of my outfit, the cardigan and skirt are two of the impulse buys I made in the dead of February. I'm absolutely in love with both of them, and they're so comfortable I feel like I'm committing some kind of crime while I'm wearing them. 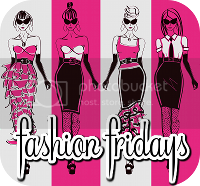 Happy Fashion Fridays, everyone! I hope you all have a wonderful and relaxing weekend! Someday, my pigeon, you will be pregnant. And you will discover that the ONLY shoes you can wear are a) comfortable, b) flat, and (worst of all) c) the sort you can slip on because bending over to tie laces or zip zippers etc is darned near impossible. Live the dream, my duck. Live the dream until you are forced into the fashionless footwear of an elderly church lady by your rapidly swelling midsection. That skirt is so cute! I'm glad you're posting more outfit pictures recently. I can understand and relate to having a killer outfit be ruined by Uggs. Living in Vermont (where the climate's almost as horrible) sometimes you have to let function win over. Hope you had a great weekend.